For more than 400 years, astronomers have studied the sun from afar. Now NASA keeps going straight there. The solar probe “Parker”, launched last month from Cape Canaveral, flies to the Sun to approach the star at a record-breaking distance. Researchers hope that this mission will help solve mysteries related to the high temperature of the solar atmosphere and the origin of the solar wind. Recently, NASA has included some of the scientific instruments of the spacecraft, and this is what Parker first saw. 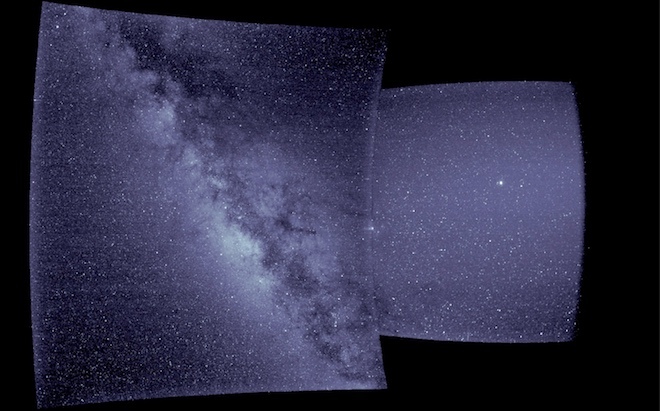 The picture was taken on September 9 with the WISPR wide-angle visualizer, which receives images from two telescopes located behind the thermal screen of the probe. On the left is the Milky Way and the galactic center; right – Jupiter among the stars of the constellation Libra. While WISPR did not look at the Sun, but in the end it will happen. The instrument is so sensitive that it can distinguish the solar wind, receiving 3D images of the inner atmosphere of the Sun, similar to medical computer tomography. The technique, called coronal tomography, is a fundamentally new approach to solar imaging. The picture is taken from a moving platform near the Sun, flying through the coronal clouds and rays. The information received by WISPR can greatly improve the forecasting of space weather.